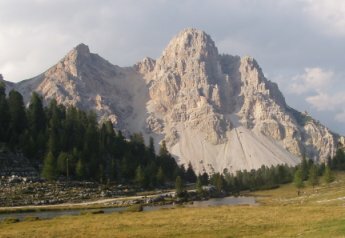 Impervious and lonely group, dominating the Pederù valley, connected by the saddle with the same name (="Irons' Saddle") with the ridge that borders the basin of the alpe di Fanes piccola. The mount Furcia dai Fers consists of two peaks, named Inner and Outer (m 2489 e m 2534 resp.). Both tops are technically easy but uncomfortable to reach; first climbed by local hunters. It is unclear whether the legend refers either to the saddle of to the mountaintops as the background of the Fanes' last desperate battle and of the final slaughter of their people. According to logic, one might suppose that the Fanes, who climbed the steep, ravinous gully, tried to defend the saddle by discharging boulders upon their enemies, but were later pursued and massacred up to the rocks of the top: but this is nothing more than guesswork. Excursions: an area difficult to reach and pathless. The place names reported by maps are uncertain also. 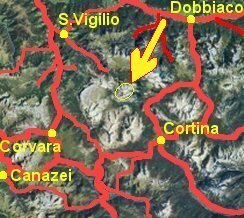 The Furcia dai Fers saddle m 2320 can be reached through scree slopes and rocks from the road to the Fanes hut (m 1988); from the saddle, the first peak of mount Furcia dai Fers, m 2489, can be attained with a 1st grade climb over ridges, gullies and scree slopes; the same type of difficulties must be overcome to reach the second peak, that dominates Pederù (m 2534).